FANCY A PINT IN THE SUN? 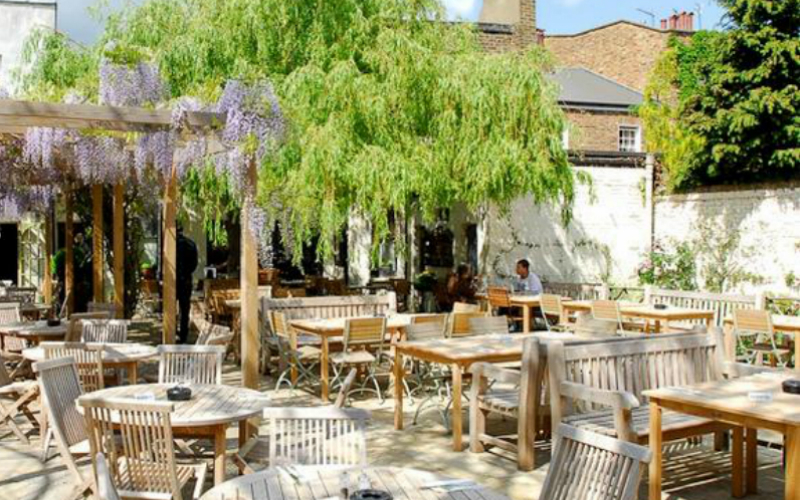 Here's the best beer gardens in London. 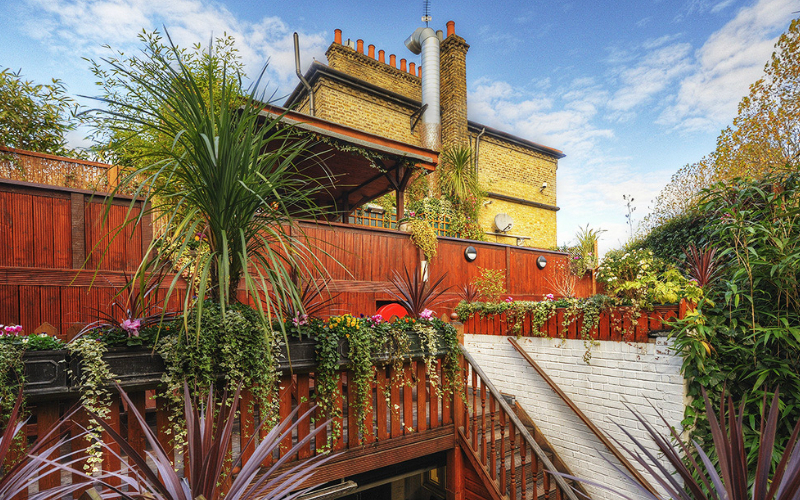 With levels of decking that creates a maze of seating and secret cubby holes surrounded by ivy, this old Irish pub could be the ultimate beer garden. Only a short walk from Finsbury Park Underground it’s a doddle to get to and hidden away from the nitty-gritty. Proper boozer with all your usuals on tap. With the size of this place you won’t be fighting for a seat in the garden. Serving up plenty of leftfield drinks and cask conditioned ales expect modern flare injected into an old country style pub. It’s a certain Mr Gallagher local too…he’s mad for it isn’t he. No London beer garden list should be complete without a mention of The Stag at Hampstead Heath. 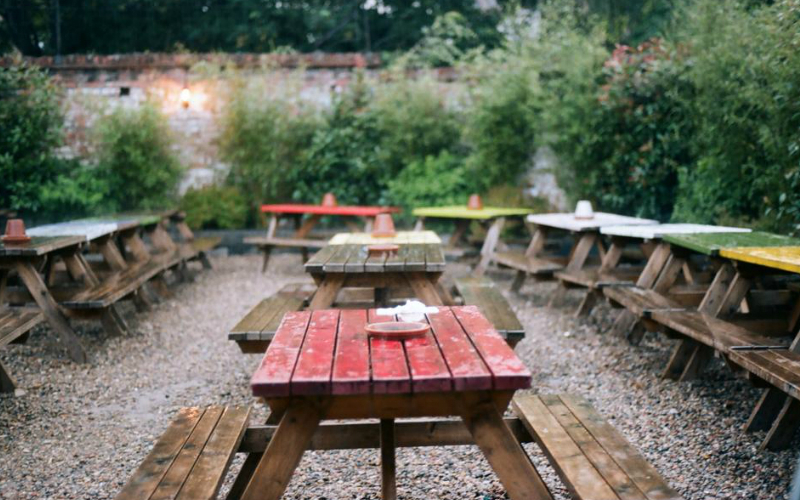 The beer garden is at the back of the pub and is very private, possibly the reason the pub attracts a host of celebs. During the summer the pub hosts garden parties, acoustic music and monster BBQ’s. Sunday arvo is the best time to visit although it is pretty busy all week long. A proper East End boozer that’s had its ups and downs over the years and even survived a fire. The beer garden is a decent size with plenty off seating. There is Hackney Brewery, Beavertown, Saltaire and Pressure Drop all on tap, so as you can see, beer is at the heart of this pub alright. Sitting in the shadows of the Olympic stadium, Crate is a brewery, bar and pizzeria serving up unique craft beer and pizzas. The IPA is a beaut though weighs in at a punchy 5.8%. 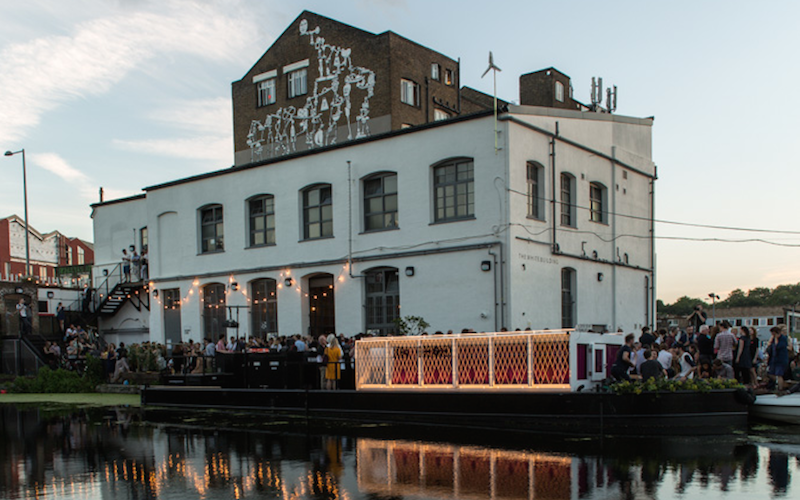 It’s a Hackney hotspot that see’s the outside area by the canal full to the brim come summer. Be prepared to join the party or if you can’t stand the heat…don’t bother coming out then! 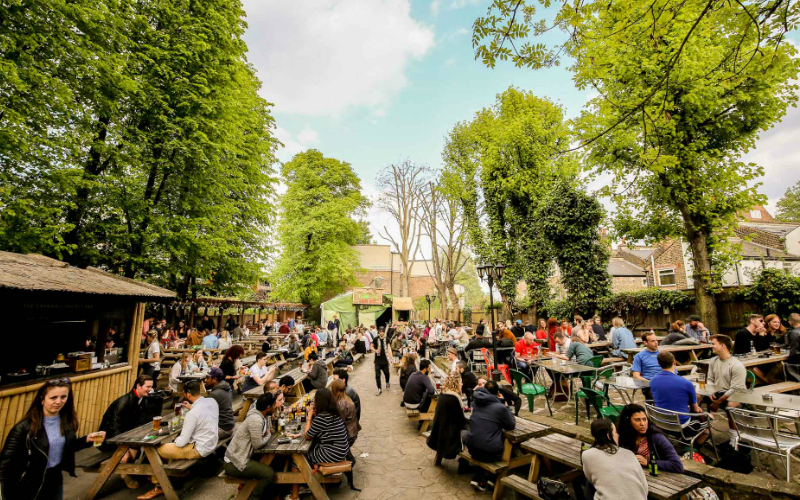 The Duke of Edinburgh has one of the biggest beer gardens in South London and it comes with a huge outdoor bar and BBQ pit. With lots of ales and cask beer on rotation, this one is a good spot for beer geeks. It’s super chilled and great place to spend a sunny afternoon. 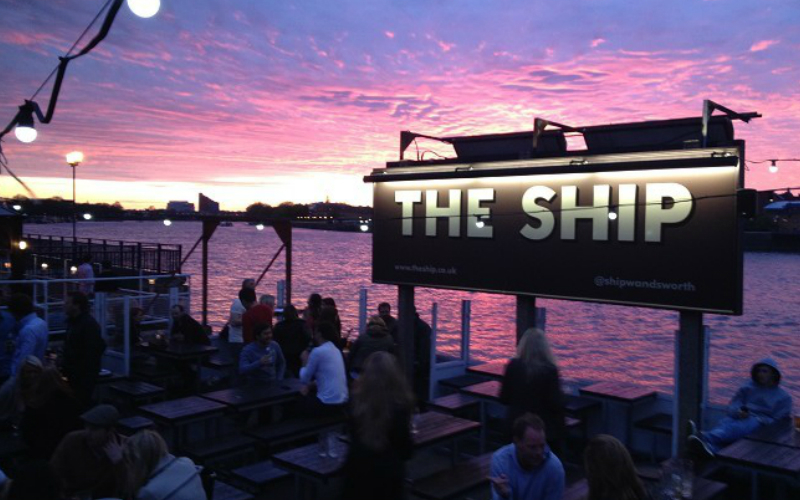 Perched on the edge of the river Thames, The Ship is a great place to spend the day drinking. As well as having a riverside BBQ, this place has three outdoor cabins each with their own TV and heater. Perfect if you want to escape the crowds or the rain. 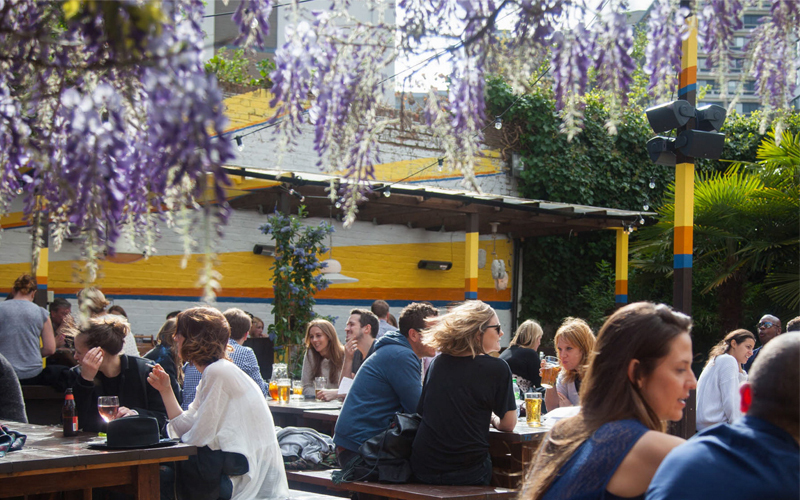 We challenge you to find a leafier beer garden in London than The Rye in Peckham. Yes, this one is an ACTUAL garden with real life grass and trees, and it’s absolutely huge. 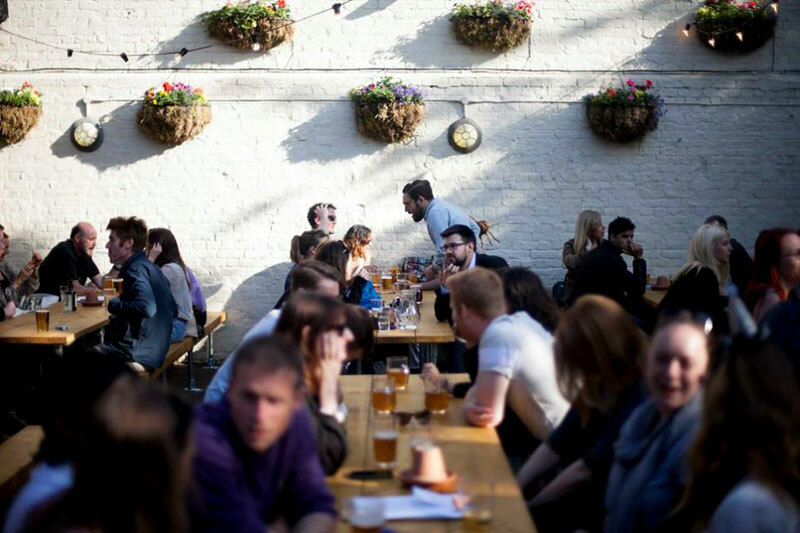 With enough picnic tables to seat half of Peckham, table tennis and a BBQ area, there is no better place to spend a summer afternoon than The Rye. 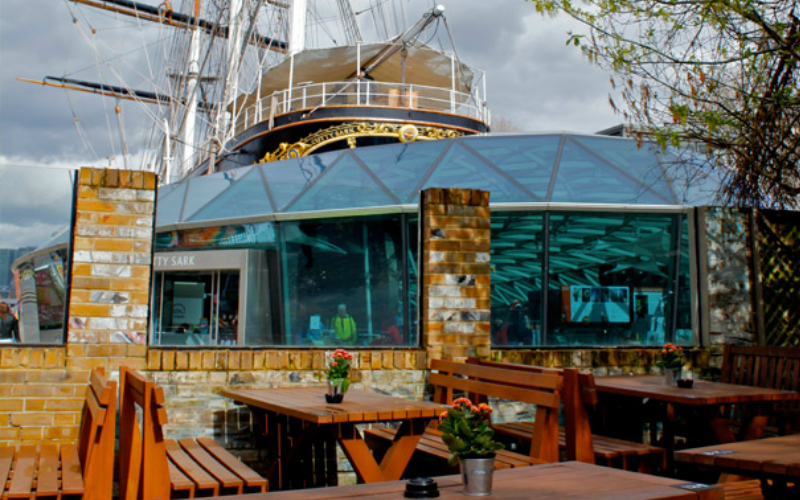 The Gipsy Moth is a traditional boozer sitting right by The Cutty Sark. Famed for their roasts and beer garden that’s big enough to seat 200 people, this is the perfect place to spend a Sunday Afternoon. This one can get super busy though, so as soon as the sun shows its face get on down there to grab a table. 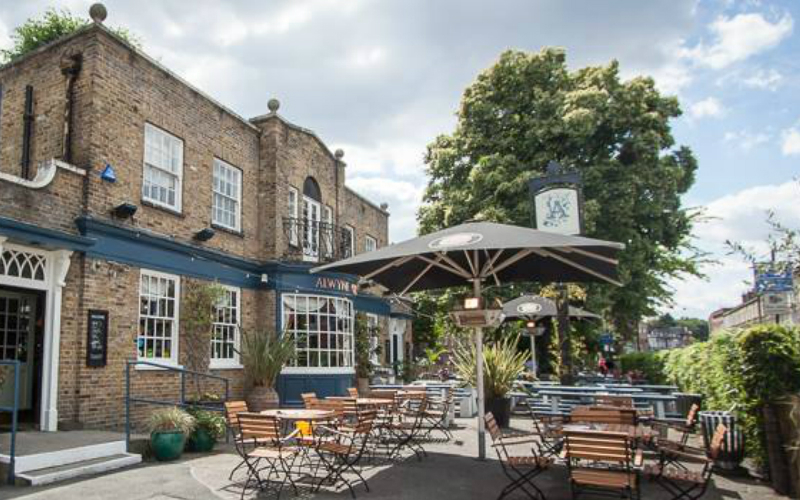 The Fat Walrus is a fave amongst South Londoners with the FOH team completely re-building the interiors when they took over in 2016, adding the beer garden – and it’s a complete sun trap. YES! With 12 draught options, 3 hand pulls and 15 bottles there’s lots of choice and before you leave make sure you have a burger, or you’ll regret it. In 2015 our beloved Hobgoblin underwent a huge refurb and blossomed into The Rose. 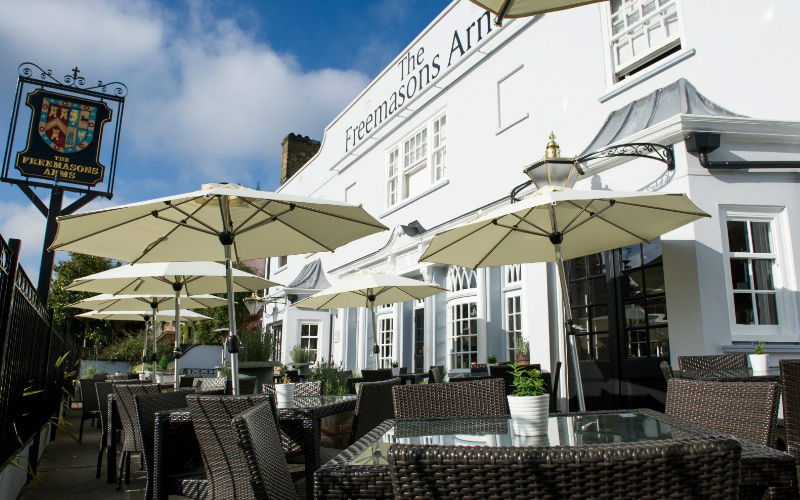 The HUGE beer garden out back is partially covered and heated – perfect for a British summer, but also a good spot for catching some rays. With bangin’ Sunday roasts and wood-fired pizza, there’s more to this place than the booze. The Prospect of Whitby has been around since 1520. 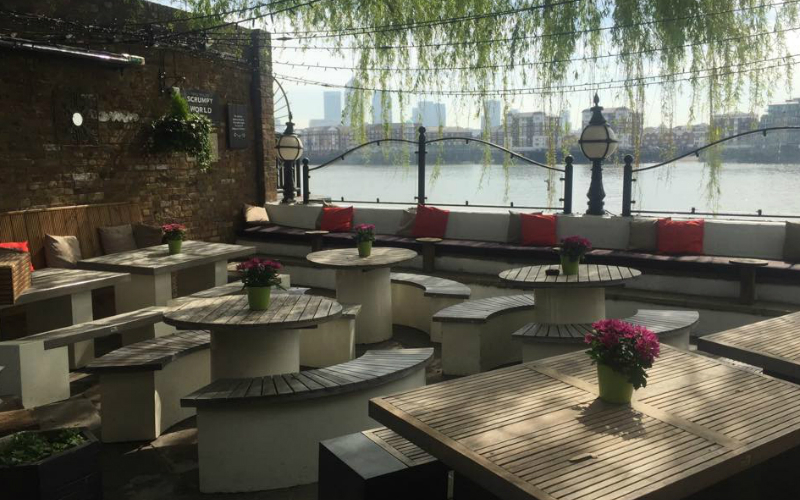 Overlooking the Thames, the traditional boozer is a great place to sink a few pints and enjoy some pub grub. Being a bit off the beaten track, you don’t have to be there by lunchtime to get a table either. When the market gets a bit too much and you want to sit in the sun in Notting Hill on a weekend, this is the place. 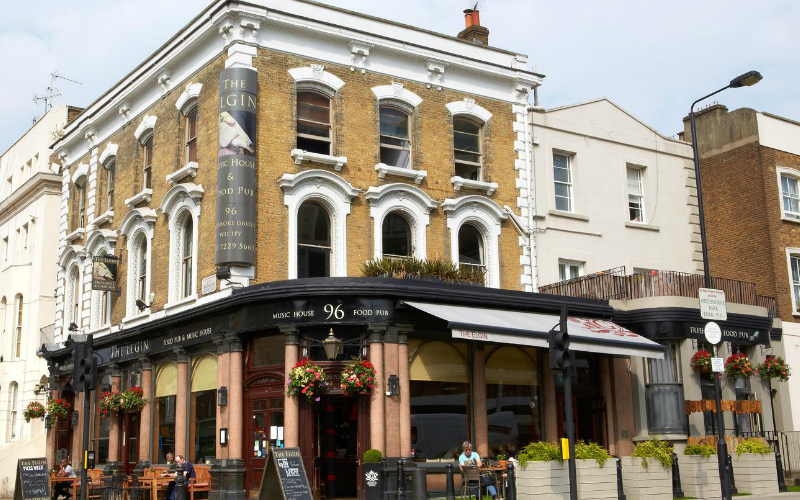 It’s round the corner from Ladbroke Grove underground and the outdoor space is right on the street across two sides of the pub which makes for great people watching. Usual suspects at the bar and a few craft ales. Grab a beer and take a seat. It’s that easy. 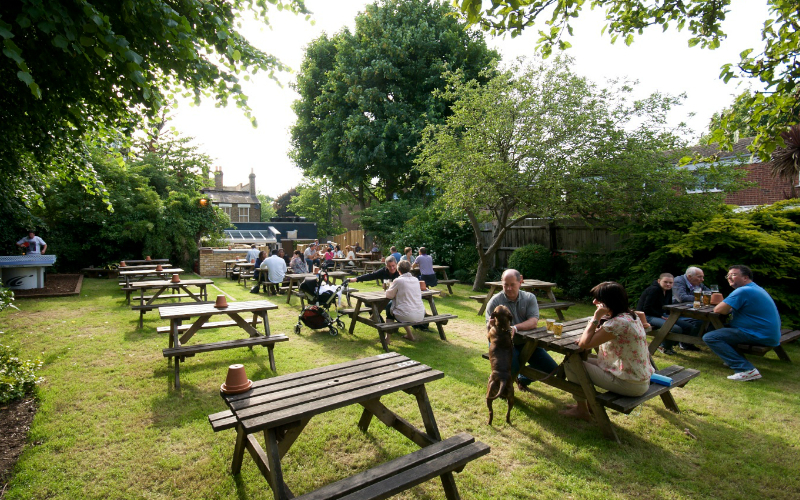 Just down the road from Highbury & Islington station, The Alwyne Castle has a mega beer garden out front, with plenty of tables and a few covered huts for bigger groups. They even get an outdoor bar up and running in the summer so you don’t have to miss any rays when getting the next round in. And with an all-day gastropub menu, you can settle in for a real session. 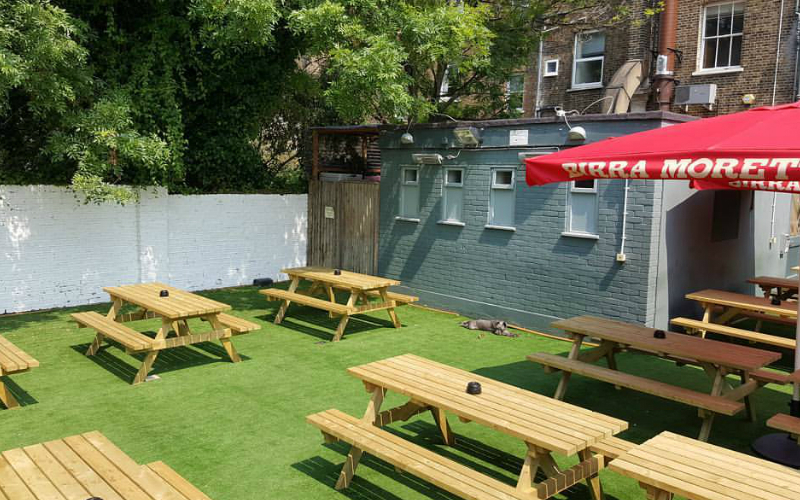 This Georgian gem definitely has one the best looking beer gardens in North London. Full of fruit trees and hanging wisteria, plus the fact that it’s in a quiet area of Islington, makes this garden a real oasis. As well as serving up award-winning grub, they do a mean BBQ too – the whole roast suckling pig is particularly special. 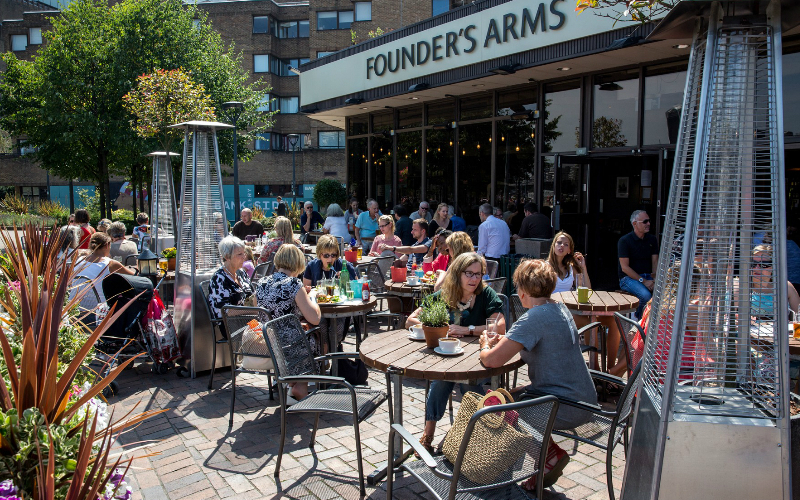 The best thing about the Founders Arms is definitely the location; right on the river with a prime view of St Paul’s and the city and practically next door to the Tate Modern. There may not be a whole lot of greenery but there’s certainly lots of space, and with classic pub grub and a strong selection of ales, beers and gins, it makes a great pit-stop after a spin round the galleries. 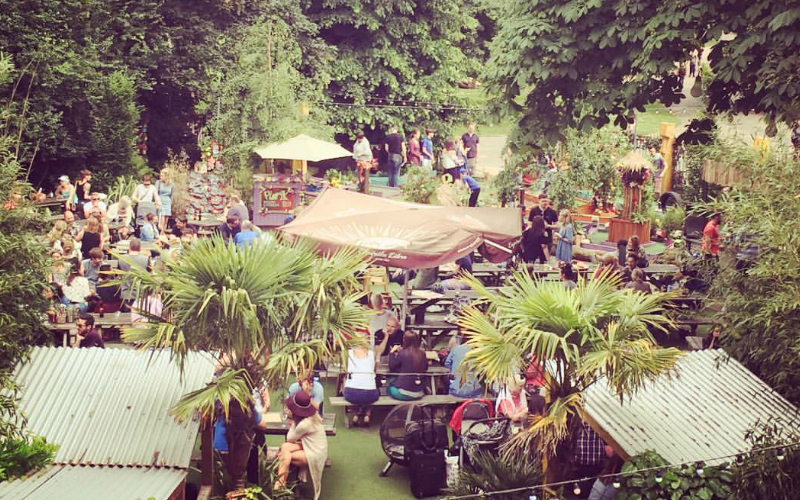 Not only is the People’s Park Tavern right on the edge of Vicky Park, it’s got its own massive garden too. Covered and heated in winter, a sun trap in summer, the garden’s great year-round, and with Plonk crazy golf, BBQs and outdoor bars, there’s always something going on, and that’s before you get to their on-site Brew Lab and bangin’ roasts. 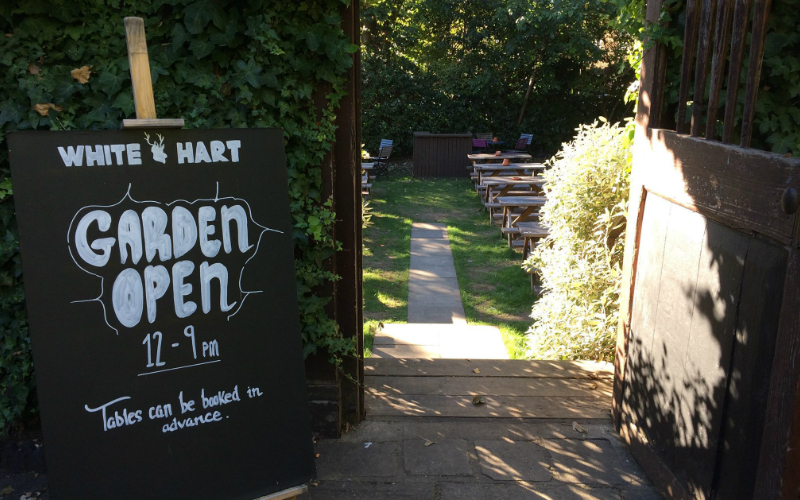 You’d never know it from the high street but The White Hart has a real cracker of a garden out back. With a courtyard surrounded by big hedges, which opens out onto a proper grassy garden, it’s no wonder this one is popular with locals. They do Saturday brunch and Sunday roasts alongside their regular menu, so you’re sorted on the food front, and they’ll even let you bring your pooch along too.